Green Roll is made of natural mineral fibres with no additives or binders. It improves the air and water regime of the soil and thus increases water retention capacity. Water is trapped between the fibres and is gradually released into the ground. By loosening the planting soil and retaining water, Green Roll creates optimal conditions for high-quality greening of plants and fast rooting of the grass. Green Roll is appropriate for covering smaller and larger surfaces with vegetation blankets or by sowing grass. Cover a drainage layer of sand or gravel (approx. 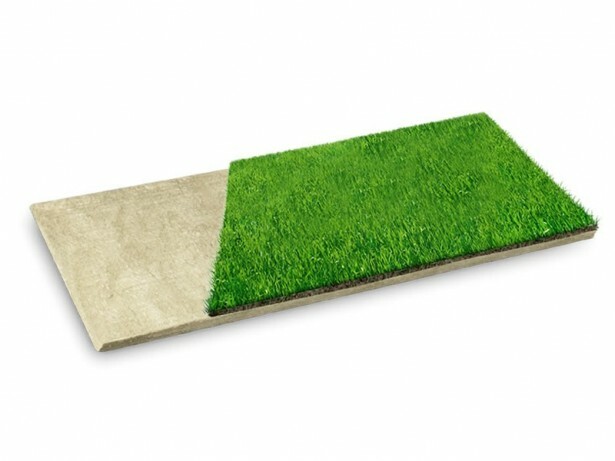 5 cm) with Green Roll and cover it with a layer of soil (10-20 cm). Cover the soil with a vegetation blanket or sow grass. Water thoroughly. Water regularly until the grass is rooted, but less than usual. Green Roll additionally retains water for the grass to draw it as required.